01:06 TO ANOTHER EDITION OF ZOLA LEVITT PRESENTS. 01:15 ON THE SERMON ON THE MOUNT SHOT IN ISRAEL. 01:21 DID YOU EVER GET UPSIDE DOWN IN YOUR RELATIONSHIP WITH OTHERS? 01:25 ARE YOU INTERESTED IN GETTING THOSE UPSIDE DOWN RELATIONSHIPS RIGHT SIDE UP? 01:29 WELL THEN GIVE JESUS A HEARING NOW AS HE DEALS WITH THAT AND MORE. 02:05 IT MUST HAVE SEEMED PECULIAR ...LOVE YOUR ENEMIES? 02:10 DO GOOD TO THOSE WHO HATE YOU? 02:13 THEY WOULD SOON FIND REASON TO APPLY THE LORD'S TEACHING. 02:17 A MAN WRESTLES WITH THE WHEEL OF HIS BROKEN WAGON. 02:26 BERATING HIM TO NO END. 02:32 THIS WOULD BE THE TIME. 02:42 "DO GOOD TO THOSE WHO HATE YOU"
02:45 "AND PRAY FOR THOSE WHO SPITEFULLY USE YOU AND PERSECUTE YOU"
02:50 "THAT YOU MAY BE SONS OF YOUR FATHER IN HEAVEN." 02:59 WE'RE INVOLVED IN WEBS OF RELATIONSHIPS AREN'T WE? 03:02 SOMETIMES THOSE RELATIONSHIPS SOUR DON'T THEY? 03:06 THE QUESTION IS, HOW DO WE DEAL WITH ALL OF THAT? 03:22 AND SOMETIMES PUSHING AROUND OTHERS. 03:24 HOW DO WE DEAL WITH ALL OF THAT? 03:28 THAT SOMETIMES PEOPLE JUST RAGE AND BLAME AND POINT FINGERS. 03:32 WHAT DOES JESUS SAY? 03:42 AND IN MY HAND IS THE BIBLE. 03:46 ABOUT DEALING WITH PRECARIOUS INTERPERSONAL SITUATIONS. 04:02 MEANS TO DO GOOD ON BEHALF OF. 04:03 DOESN'T MEAN TO ALWAYS FEEL GOOD. 04:09 AND YOU PROBABLY DO TOO. 04:15 HE SAYS THAT WE SHOULD BLESS THOSE WHO CURSE. 04:20 TRUTH IS...IS ALL THIS IS EASIER SAID THAN DONE ISN'T IT? 04:33 TO PEOPLE THAT AREN'T BLESSINGS THEMSELVES. 04:36 HE SAYS, "AND TO DO GOOD TO THOSE WHO SPITEFULLY USE YOU". 04:52 EVEN IN A WORLD THAT'S NOT VERY GOOD TOUS. 04:59 BUT SOMETIMES ME AND PATTY GET TANGLED UP. 05:20 ..."OH, LISTEN JEFF, OKAY, ENOUGH, GOD BLESS YOU"
05:30 IMPORTANT AS THE DE-ESCALATION OF CONFLICTS THAT ARE CASCADING UPWARDS. 05:44 WE WANT TO TRY AND LOVE OTHERS. 05:52 IT'S A GREAT RECIPE FOR HEALING, FOR A WHOLENESS. 06:01 THOUGH OUR NATURES DON'T NECESSARILY ABIDE THE PRACTICE EASILY. 06:16 AND AT ONE LEVEL THAT CAN BE AN OPPRESSING VERSE CAN'T IT? 06:20 IS THAT NONE OF US REALLY ARE PERFECT. 06:25 BECAUSE WE DON'T UNDERSTAND THE ORIGINAL LANGUAGE. 06:33 IT MEANS TO BE INDISCRIMINATE. 06:49 LET'S REALIZE THAT WE ALL HAVE OUR GOOD DAYS AND OUR BAD DAYS. 06:56 BY VIRTUE OF OUR SO DOING WE'LL GET THE BETTER OF VEXING SITUATIONS AND PEOPLE. 07:29 AND FOR ONE'S GOOD DEEDS. 07:32 "CHARITABLE DEEDS ARE HONORABLE"
07:36 "BUT NOT WHEN THEY ARE FLAUNTED". 07:41 "BUT NOT FROM THE FATHER IN HEAVEN." 07:56 BECAUSE I KNOW THAT POOR PEOPLE BENEFIT FROM THE GIFT. 08:14 "HOW GOOD I AM". 08:51 AND SEND IT AWAY TO A CHARITY. 08:57 IT MEANS TO BE RIGHTEOUS. 09:12 IF I UNDERSTAND THE LORD CORRECTLY HE SAYS, "DO THAT". 09:20 AND WE NEED INDIVIDUALS TO RISE UP AND BE KINDLY DISPOSED. 09:25 "LORD, HOW DO YOU WANT ME TO BE GIVING?" 09:28 "WHAT DOES THAT MEAN FOR ME MONETARILY?" 09:30 IT'S NOT JUST ME TALKING TO YOU ABOUT "OH SUPPORT THIS MINISTRY"
09:33 OR...I HAVE TO TALK TO MYSELF ABOUT WHAT IT MEANS TO BE LOVING, CARING AND SHARING. 09:42 I'M WARNED HERE, "DON'T BE POMPOUS IN THE GIVING JEFFREY." 10:01 WHEN YOU HAVE TO ASK THE QUESTION HOW YOU CAN ATTEND TO YOUR BUSINESS. 10:05 WHAT I WANT YOU TO HEAR IN THIS IS THAT IN THE GIVING, THERE IS A GETTING. 10:26 JUST LET'S LAND ON THOSE WORDS FOR A SECOND. 10:29 HE SAYS, "LISTEN, BE GIVING." 10:30 "DON'T LET ANYBODY KNOW." 10:32 "DO IT IN SECRET." 10:33 "AND YOU KNOW WHAT?" 10:34 "YOUR FATHER WHO'S IN SECRET SEES." 10:43 IF WE CAN JUST PUT SOME APPLICATION TO THE MESSAGE. 10:54 AND FRIENDS THERE'S A BLESSING IN THAT IF WE'LL OPT TO BE THAT. 11:00 I'M RAMPING UP A LITTLE. 11:06 TO HEAR JESUS ON THIS. 11:08 "THE LORD WHO SEES IN SECRET WILL REWARD YOU". 11:14 WHEN YOU GIVE A CHARITABLE DEED...DO IT. 11:21 AND THERE'S A WAY THAT HE'S GOING TO REWARD YOU IN THE DOING. 11:35 IT MEANS SOMETHING TO ME. 11:41 AND WATCH THE MIRACLE HOW GOD BLESSES US BY VIRTUE OF OUR SO BEING. 12:03 ASK FOR OUR FREE MONTHLY NEWS LETTER "THE LEVITT LETTER". 12:07 WHEN YOU CALL BE SURE TO ASK FOR OUR FREE CATALOGUE WITH THE LATEST VIDEOS, BOOKS, AND MUSIC. 12:16 READING PACKETS, TEACHINGS CDs, AND MAIL-IN TESTS. 12:23 OR CRUISE THE MEDITERRANEAN VISITING GREECE AND EPHESUS. 12:26 PLEASE CONTACT US FOR MORE INFORMATION. 12:36 FOR THEY WERE FISHERMEN. 12:42 AS DO THE FISHERMEN LIKE DANIEL CARMEL. 12:51 ON THE SEA OF GALILEE WORSHIP BOATS. 12:53 JOIN US IN WORSHIP ON THE GALILEE. 13:21 EXPERIENCING A BLESSING IN THE PROCESS OF SO DOING. 13:29 HOW ABOUT GOING WITH ME? 13:32 WHY DON'T WE TAKE THE TRIP OF A LIFETIME? 13:41 GIVE US A CALL. 13:44 AND WE'LL SEE WHERE IT ALL LEADS. 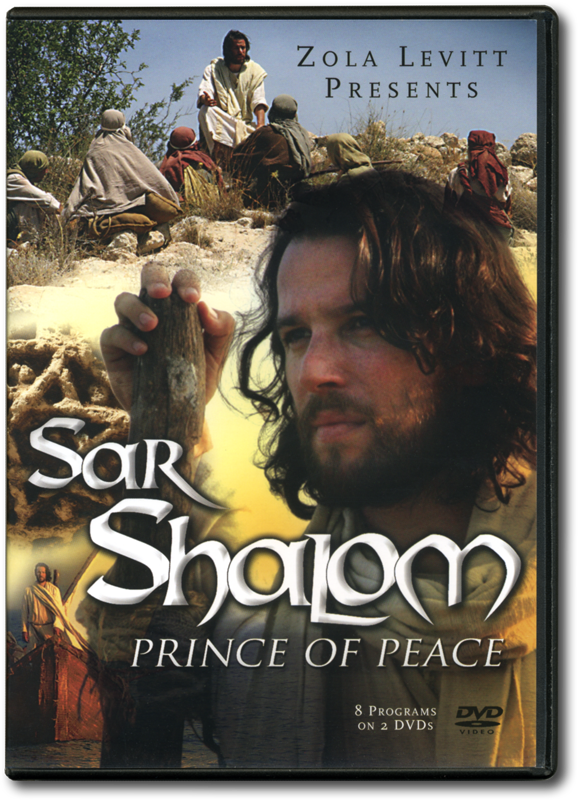 14:02 THE DVDs FOR "SAR SHALOM - PRINCE OF PEACE". 14:14 THIS IS FOR YOU. 14:16 THIS IS FOR YOU TOO. 14:17 IT WON'T COST YOU ANYTHING. 14:18 IT'S OUR MONTHLY NEWSLETTER. 14:27 AND GET IT THAT WAY. 14:29 WE HAVE BOOKS AND MORE. 14:30 YOU CAN ALWAYS GET OUR CATALOG AS WELL AND LEARN MORE. 14:34 OFF WE GO NOW TO LEARN A LITTLE MORE ABOUT JESUS. 15:17 AS WE FORGIVE OUR DEBTORS. 15:38 "LORD TEACH US TO PRAY". 15:40 THEY WANTED TO "DAVEN"
15:45 "WELL GO WITH THIS GUYS." 15:50 BECAUSE HE'S TELLING US HOW TO DO IT. 15:52 AND WHAT DOES HE SAY? 16:19 IS VERY, VERY JEWISH. 16:23 IS WHAT'S CALLED "Kadosh HaShem"
16:26 AND CONVERSELY "Chilul HaShem". 16:29 IT MEANS TO SANCTIFY THE NAME OR TO VILIFY THE NAME. 16:36 FROM A JEWISH PERSPECTIVE. 16:37 THE PEOPLE OF ISRAEL ARE TO MAKE GOD'S NAME LOOK GOOD IN THE WORLD AND WHY IS THAT? 16:43 "YISRAEL", "THE PRINCE OF GOD". 16:49 TO REPRESENT HIM WELL. 16:54 AND JUDAISM DOES MUCH THE SAME. 17:15 AND HAS BEEN FOR SOME TIME. 17:20 AND HE WAS COMMENDING THE SAME SORT OF VISION NOW WASN'T HE? 17:28 THAT I WANT TO SHARE WITH YOU. 17:32 "OUR FATHER WHO ART IN HEAVEN,"
17:35 "THY KINGDOM COME..." ETC. 17:38 "AND FORGIVE US OUR TRESPASSES"
17:42 "AS WE FORGIVE THOSE WHO TRESPASS AGAINST US." 17:48 "LEAD US NOT INTO TEMPTATION"
17:50 "DELIVER US FROM EVIL". 18:03 TO BE AGENTS OF FORGIVENESS THEMSELVES. 18:20 AND GOD KNOWS IT'S REALLY HARD TO LOVE THE UNLOVABLE...IS IT NOT? 18:25 AND EVERYONE SAID "AMEN". 18:51 WE PARTICULARLY BECKON GOD FOR FORGIVENESS AND HELP. 19:03 AND GIVE SOME HELP AND EXERCISE SOME FORGIVENESS. 19:14 AND HE KNOWS YOU MIGHT NEED IT AS WELL. 19:21 AND THEN LOOK TO MANIFEST HIS PRESENCE IN THE WORLD AT LARGE. 19:38 AS HE SINGS "THE LORD'S PRAYER". 21:50 AS WE GET TRANSPORTED INTO GOD'S PRESENCE. 21:57 AND WHY IS THAT? 21:58 BECAUSE THERE'S A GOOD PEACE THAT'S AVAILABLE TO PEOPLE. 22:20 AND TO MAKE HIM KNOWN IN A DECIDEDLY JEWISH CONTEXT. 22:28 AND UNDERSCORES THE IMPORTANCE OF LOOKING AT JESUS' WORD AS A JEW. 22:36 AND SO OFF WE GO ON LOCATION AND HEAR FROM THE LATE ZOLA LEVITT. 22:46 AS THERE ARE TEN COMMANDMENTS IN THE LAW. 22:48 THE DISPUTE TERMS OF RABBINICAL DEBATE ARE USED IN THE SERMON. 22:56 "I COME TO NOT DESTROY THE LAW BUT TO FULFILL IT". 23:10 AND A LOT OF MEANING COMES OUT OF THAT. 23:14 "I'M NOT THE DESTROYER; I'M THE FULFILLER OF THIS LAW." 23:17 "I RAISE IT TO HIGHEST INTENTION." 23:20 THE AUDIENCE WERE USED TO THIS FORM AND STYLE. 23:26 NOT SCRIBES AND PHARISEES. 23:30 "IF YOUR RIGHTEOUSNESS DOES NOT EXCEED THAT OF THE SCRIBES AND PHARISEES"
23:33 "YOU CANNOT ENTER INTO THE KINGDOM OF HEAVEN." 23:39 BOY THINGS WOULD HAVE STOPPED RIGHT THERE IF THEY WERE. 23:53 THIS IS THE HIGHER LAW. 23:56 MESSIAH'S MESSAGE IS MUCH MORE UNIVERSAL THAN THE LAW. 24:05 AND WHY DO WE USE THESE QUOTATIONS? 24:15 AND THEIR WISDOM IS DERIVED FROM SCRIPTURE. 24:20 BUT IT'S VERY INTERESTING TO HEAR WHAT THEY WROTE. 24:29 "MOSES BY THE MIRACLES WHICH HE BROUGHT"
24:32 "DREW BUT A SINGLE NATION TO THE WORSHIP OF GOD"
24:35 "BUT THE MESSIAH WILL DRAW ALL NATIONS TO THE WORSHIP OF GOD." 24:40 HEARING ZOLA MAKES ME A TAD BIT NOSTALGIC AND WHY IS THAT? 24:48 I HELPED HIM WORK ON THAT AND OTHER SERIES AROUND THAT TIME. 24:52 THE WORD OF GOD IS TIMELESS ISN'T IT? 25:05 AND IT'LL GO BEYOND MY OWN. 25:08 AND HOPEFULLY IT MAKES ITS WAY INTO YOUR WORLD REAL TIME. 25:12 AND WHAT DO I MEAN BY THAT? 25:25 IS HE DRAWING YOU? 25:33 BECAUSE YOU'RE BORED IN YOUR LIVING ROOM AND WATCHING TELEVISION? 25:49 A CERTAIN CALL OF GOD ON YOUR LIFE. 25:52 WHERE DOES THAT BEGIN AND WHAT DOES IT ALL MEAN? 26:05 ALWAYS BEGINS WITH US FESSING UP WITH WHAT WE DO KNOW. 26:18 WE GO TO HIM AND ASK HIM FOR FORGIVENESS. 26:27 AND THEN OFF WE GO INTO THE FUTURE. 26:40 SO WHY NOT MAKE THAT DECISION NOW?